Hoof Builder provides the building blocks for your horse to maintain healthy, strong hooves. 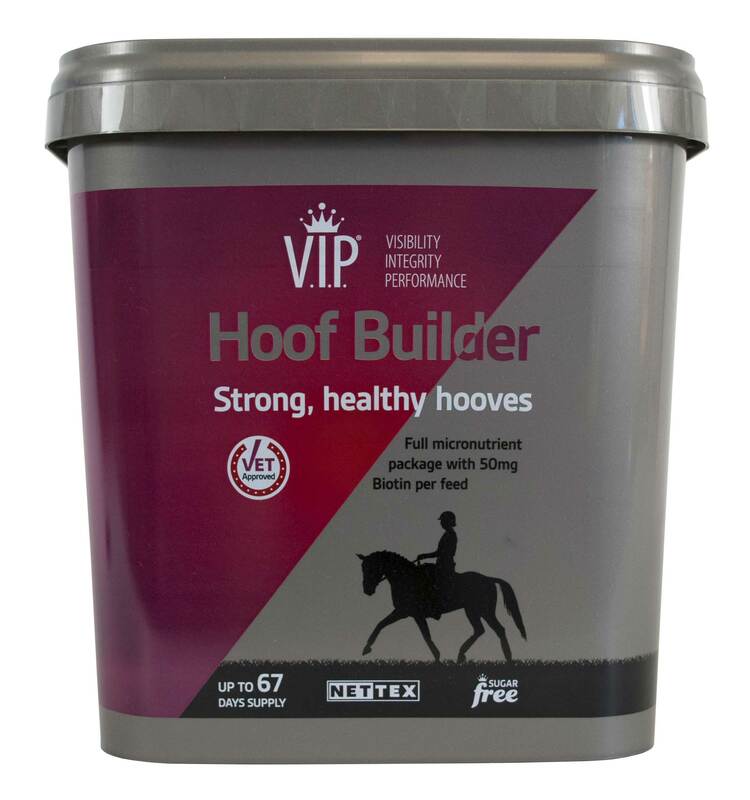 Its V.I.P.® formula is Vet Approved and combines high levels of biotin with fundamental micronutrients necessary to support healthy, strong hooves and encourage hoof growth. BIOTIN - Delivers 50mg biotin per feed. Biotin has been shown to support hoof quality in horses with poor quality hooves. At higher feeding rates biotin has been shown to improve the growth rate of hooves. MSM - Source of bioavailable sulphur, essential for hoof strength. METHIONINE, LYSINE AND CYSTEINE - Supports sturdiness and resiliency of the hoof. CALCIUM, ZINC AND MANGANESE - Important trace elements for hoof integrity. BREWER’S YEAST - Prebiotic to support a stable gut and optimal nutrient absorption. LINSEED MEAL - Rich in Omega-3 fatty acids to maintain hoof and skin condition. VITAMINS - Comprehensive package to support hoof health. SUGAR FREE - Highly palatable formula. Healthy hooves are of utmost importance when it comes to your horse’s wellbeing. Poor hoof quality can lead to cracked and crumbling hooves. Maintaining healthy hoof growth and hoof quality is essential to maintain soundness. Feed Hoof Builder to provide V.I.P.® care for distressed hooves and support healthy hoof growth. Results will be visible within 3 months, although it can take up to 9 months for a full new healthy hoof to grow.